_ A temporary 58-channel sound installation and live musical performance throughout the 3.5-acre Kaiser Rooftop Garden, created with a team of Oakland artists, first presented June 2010 (sequel returns May 2013). Oakland composer Hugh Livingston creates a strolling musical experience that winds throughout the spectacular Kaiser Rooftop Garden overlooking Lake Merritt, during a Sunday afternoon’s late golden hours leading to sunset over the Lake. As many as 64 speakers deployed throughout the Garden echo, twitter, hum and croon as eight live instrumentalists weave through the space, adding their flittering sounds to the overall tapestry of light, color, flora, waterworks, and sonic enhancements. Credits: Produced and composed by Hugh Livingston, with Brendan Aanes and Andrea Williams. Field of Gongs by Matthew Goodheart. Live musical performances by Gretchen Jude, ma++ ingalls, Kyle Bruckmann, Shayna Dunkelman. 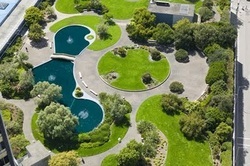 Inspired by Rockefeller Center, industrialist Henry Kaiser hired landscape architects Osmundson & Staley to design a garden atop the garage next to his headquarters in downtown Oakland. The garden opened in 1960 as the first true post-World War II rooftop garden in the US., and for many years the largest, at 3.5 acres. The hardscaping incorporated aluminum, cement, and materials that defined Kaiser Industries. According to the Cultural Landscape Foundation, altered environmental conditions resulting from nearby construction threatens the garden's expected longevity. Further, a proposed development would eliminate half or all of the garden for a new tower overlooking the Lake. Using multiple computers, over 50 speakers and transducers and 1 mile of cable, the Garden is transformed into multiple zones of sonic activity. Each year I come up with new sculptural elements that make sound, but the 2010 collection included: River Chairs, which have a strong vibration of cello and water sounds when you sit in them; Hybrid Bird Cones, like giant flower buds that you peer into to listen instead of sniff; 40 percussion instruments hidden throughout the garden to be played by anybody; floating bowls on the pond that interact with the ducks; a field of gongs that articulate a harmonic progression dictated by the audience’s progression; a grove of cuckoos, sounds of clocks and birds and street crossings; the pine-lute pavilion, a dialogue of two pine trees evoking a Chinese meditative garden where the wind washes away the instrumental sounds; a collection of vintage 78 RPM players with custom-pressed vinyl and actors in period dress to wind them up. Also, most notably, the distribution — in waves of color — of over 200 brightly colored parasols, to engage the audience in the performance and heighten the perception of sound sources. I am interested in introducing people to new spaces. I am interested in introducing people to new music. I have the opportunity to overlay my artistic creations—as if exhibiting in a giant art gallery, a larger-than-life concert hall—on this dynamic and varied space. The sound is a thread that links ends of a garden, with fragments of melody or rhythm being re-heard an hour later in a grove of trees or floating on the pond. The sound becomes a lure that leads visitors to explore. It was said of the Picturesque, an invention of the Renaissance, that it was the first garden design to ‘validate the stroll’. My outdoor sound overlays enhance this dimension. Sound in a garden can invite you to sit in one spot, to hear it swirling around you, to meditate and enjoy a single perspective. Sound in a garden can also lead you to a new location, inviting you forward as the bird in T.S. Eliot’s Four Quartets is leads a rose garden tour. In these manners, I compose music which ‘validates the stroll’. Hence the title of the project, referencing a famous garden in Suzhou, outside Shanghai, that in turn takes its name from a Tang Dynasty poem. The Chinese gardens were as devoted to scenography as the picturesque Western gardens; these were planned and designed to surprise the visitor as they turned a corner. The layout, plantings, rocks and topography suggested point of view, a place to linger and take in the sum of visual parts. With my sound work I create the same effect: an instinct to linger, to listen, to appreciate. My composition brings these elements together, and draws the audience into an unusual musical experience, unfolding over time, and with multiple dimensions of sensory input.